Area: 64,589 sq. km. (24,938 sq. mi. ); slightly larger than West Virginia. 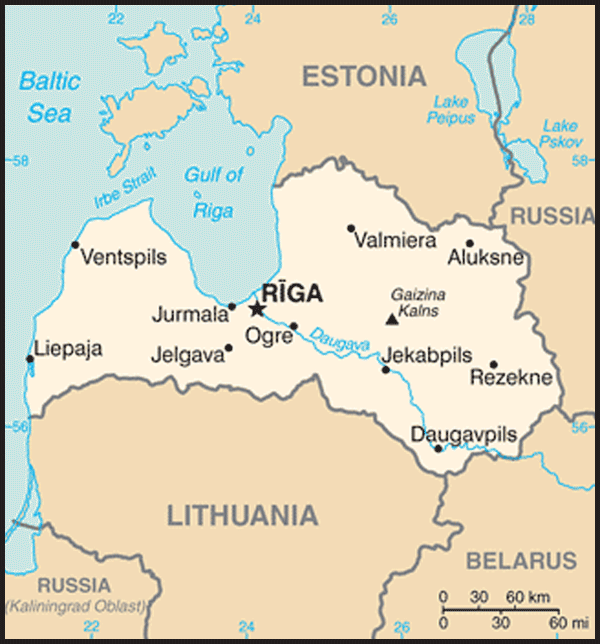 Cities (2011): Capital: Riga (700,107). Other cities — Daugavpils (102,870); Liepaja (83,061); Jelgava (64,279); Jurmala (55,767); Ventspils (42,371); Rezekne (34,522). Terrain: Fertile low-lying plains predominate in central Latvia, highlands in Vidzeme and Latgale to the east, and hilly moraine in the western Kurzeme region. Forests cover one-third of the country, with over 3,000 small lakes and numerous bogs. Although there are more than 12,000 rivers in the country, the only major waterways are the Daugava (Dvina) River, which flows through the center of the country and empties into the Gulf of Riga, and the Gauja River, which rises in the Vidzeme Upland. Land use: 45.7% forest and woodland, 18.1% arable land, 10.2% meadows and pastures, 3.7% inland waters, 22.2% other. Climate: Temperate, maritime, with four seasons of almost equal length. Average temperatures in January range from -3°C (26.6°F) in the western, coastal town of Liepaja, to -6.7°C (19.9°F) in the inland town of Daugavpils. Mean temperatures for July range from 16.4°C (61.52°F) in Liepaja to 17.0°C (62.6°F) in Daugavpils. Annual precipitation averages 57 centimeters (23 in.). Nationality: Noun and adjective: Latvian(s). Annual population growth rate (2010): -0.8%. Birth rate — 8.6/1,000. Death rate — 13.4/1,000. Migration rate (2010) — 2,790 immigrants; 10,702 emigrants. Density (2011): 34.5/1 sq. km (this figure is far lower in the rural parts of Latvia). Urban dwellers — 67.5%. Major ethnic groups (2011): Latvians 59.5%, Russians 27.4%, Belarusians 3.5%, Ukrainians 2.4%, Poles 2.3%. Religions (2010): Roman Catholics (22.2%), Lutherans (19.3%), Orthodox Christians (16.5%). State language: Latvian. Russian also is spoken by most people. Education: Years compulsory: 9. Enrollment (2010-2011) — 353,032 students in 1,532 schools (including pre-school establishments and vocational education institutions) and 103,856 university students. Literacy — 99.8%. Health: Infant mortality rate (2010): 5.7/1,000. Life expectancy (2010)--68.8 years male, 78.4 years female. Work force (2010, 1.133 million): Industry — 16.9%; trade — 19.0%; construction — 7.1%; agriculture/forestry — 8.8%; transport/communications — 11.8%; public administration/defense — 6.6%; education — 10.2%; health care/social welfare — 5.0%. Constitution: The law "On the Republic of Latvia Status as a State," passed by parliament on August 21, 1991, provided for the reinstatement of the 1922 constitution. Branches: Executive: President (head of state), elected by parliament every 4 years; Prime Minister (head of government). Legislative — Saeima (100-member parliament). Judicial — Supreme Court; Constitutional Court; civil law system. Administrative regions: 109 districts and 9 cities. Principal political parties: Harmony Center - 31 seats, Zatlers' Reform Party (ZRP) - 22 seats, Unity - 20 seats, National Alliance - 14 seats, Greens and Farmers - 13 seats. GDP (2010 nominal): U.S. $23.7 billion. Annual growth rate (2010): -0.3%. Annual inflation rate (2010, Dec.-to-Dec.): 2.5%. Per capita income (2010): U.S. $10,631. Natural resources: Peat, limestone, dolomite, gypsum, timber. Agriculture, hunting, and forestry (3.6% of 2010 GDP): Products — cattle, dairy foods, cereals, potatoes, timber. Land — 1.83 million hectares, of which 63% is arable, 35% meadow and pasture, and 1% orchards. Industry, including energy (15.1% of 2010 GDP): Types — metalworking, machinery and tools, light electrical equipment and fittings, textiles and footwear, technological instruments, construction materials, processed foods. Services (66.3% of 2010 GDP): Types: retail and wholesale trade; real estate, renting, and business activities; transport, storage, and communication. Major sectors of the economy (2010): Retail and wholesale trade (14.7% of 2010 GDP); real estate, renting, and business activities (16.9% of 2010 GDP); manufacturing (10.9% of 2010 GDP); transport, storage, and communication (11.2% of 2010 GDP); construction (4.5% of 2010 GDP); financial intermediation (4.2% of 2010 GDP). Trade (2010): Exports: $8.775 billion: base metals and articles of base metal 13.8%; wood and articles of wood 19.0%; machinery and mechanical appliances; electrical equipment 13.0%; products of the chemical or allied industries 7.4%; food and agricultural products 17.5%; textiles and textile articles 4.4%. Major markets — Lithuania 16.2%, Estonia 13.5%, Russia 10.6%, Germany 8.7%, Sweden 6.3%, Denmark 3.9%. Imports — $11.050 billion: machinery and mechanical appliances; electrical equipment 16.4%; mineral products 15.4%; vehicles 7.2%; base metals and articles of base metal 10.2%; products of the chemical or allied industries 11.2%; food and agricultural products 16.3%; plastics and articles thereof; rubber and articles thereof 5.6%; textiles and textile articles 4.6%. Partners — Lithuania 17.1%, Germany 11.5%, Russia 10.0%, Poland 7.9%, Estonia 7.2%, Sweden 3.6%, Finland 4.9%. Latvia reflects the strong cultural and religious influences of centuries-long Germanic and Scandinavian colonization and settlement. Eastern Latvia (Latgale) retains strong Polish and Russian cultural influences. This highly literate society places a strong emphasis upon education, which is free and compulsory until age 16. Traumatic wartime events, postwar emigration, deportations, and Soviet Russification policies from 1939 to 1989 reduced the percentage of ethnic Latvians in Latvia from 73% to 52%. In an attempt to preserve the Latvian language and prevent ethnic Latvians from becoming a minority in their own country, Latvia enacted language, education, and citizenship laws which require a working proficiency in the Latvian language in order to acquire citizenship as an adult. Such legislation has caused concern among many Russophone non-citizen residents, despite Latvian legal guarantees of universal human and civil rights regardless of citizenship. Written with the Latin alphabet, Latvian is the language of the Latvian people and the official language of the country. It is an inflective language with several analytical forms, three dialects, and German syntactical influence. The oldest known examples of written Latvian are from a 1585 catechism. Latvian and Lithuanian are the only surviving direct descendents of the Baltic languages of the Indo-European family. While Latvia was a component of the U.S.S.R., Russian was the official language, so many Latvians also speak Russian, and the resident Slavic populace generally speaks Russian as a first language. By the 10th century, the area that is today Latvia was inhabited by several Baltic tribes who had formed their own local governments. In 1054, German sailors who shipwrecked on the Daugava River inhabited the area, which initiated a period of increasing Germanic influence. The Germans named the territory Livonia. In 1201, Riga, the current capital of Latvia, was founded by the Germanic Bishop Albert of Livonia; the city joined the Hanseatic League in 1285 and began to form important cultural and economic relationships with the rest of Europe. However, the new German nobility enserfed the indigenous people and accorded them only limited trading and property rights. Subsequent wars and treaties led to Livonia's partition and colonization for centuries. In 1721 Russia took control over the Latvian territories as a result of its victory over Sweden in the Great Northern War. During this time there was little sense of a Latvian national identity, as both serfdom and institutional controls to migration and social mobility limited the boundaries of the indigenous people's intellectual and social geography. However, in the 1860s, the Young Latvian Movement was formed in order to promote the indigenous language against Russification policies and to publicize and counteract the socioeconomic oppression of Latvians, 60% of whom belonged to the landless, urban class. This growing proletariat base became fertile ground for the ideas of western European socialism and supported the creation in 1903 of the Latvian Social Democratic Union (LSDU), which championed national interests and Latvia's national self-determination, especially during the failed 1905 Revolution in Russia. The onset of World War I brought German occupation of the western coastal province of Kurzeme, which Latvians heroically countered with several regiments of riflemen commanded by Czarist generals. The military campaign generally increased Latvian and LSDU support for the Bolsheviks' successful October Revolution in 1917, in the hopes of a "free Latvia within free Russia." These circumstances led to the formation of the Soviet "Iskolat Republic" in the unoccupied section of Latvia. In opposition to this government, and to the landed barons' German sympathies, stood the Latvian Provisional National Council and the Riga Democratic Bloc. These and other political parties formed the Latvian People's Council, which on November 18, 1918 declared Latvia's independence and formed an army. The new Latvian Army won a decisive battle over the German forces and consolidated that success against Red Army forces on the eastern Latgale front. These developments led to the dissolution of the Soviet Latvian government on January 13, 1920 and to a peace treaty between Latvia and Soviet Russia on August 11 later that year. On September 22, 1921, an independent Latvia was admitted to the League of Nations. The government, headed by Prime Minister Ulmanis, declared a democratic, parliamentary republic. It recognized Latvian as the official language, granted cultural autonomy to the country's sizeable minorities, and introduced an electoral system into the Latvian constitution, which was adopted in 1922. The ensuing decade witnessed sweeping economic reform, as the war had devastated Latvian agriculture, and most Russian factories had been evacuated to Russia. However, economic depression heightened political turmoil, and, on May 15, 1934, the Prime Minister dismissed the parliament, banned outspoken and left-wing political parties, and tightened authoritarian state control over Latvian social life and the economy. The German-Soviet Nonaggression Pact of 1939 steadily forced Latvia under Soviet influence, culminating in Latvia's annexation by the Soviet Union on August 5, 1940. On June 14 of the following year, 15,000 Latvian citizens were forcibly deported and a large number of army officers shot. The subsequent German occupation witnessed the mobilization of many Latvians into Waffen SS legions, while some Latvians joined the Red Army and formed resistance groups, and others fled to the West and East. An estimated 70,000, or 89.5%, of Latvian Jews were killed in Latvia under Nazi occupation. Up to one-third of Latvia's pre-war population (approximately 630,000 residents) was lost between 1940 and 1954 due to the Holocaust and the Soviet and Nazi occupations. In July 1989, following the dramatic events in East Germany, the Latvian Supreme Soviet adopted a "Declaration of Sovereignty" and amended the Constitution to assert the supremacy of its laws over those of the U.S.S.R. Candidates from the pro-independence party Latvian Popular Front gained a two-thirds majority in the Supreme Council in the March 1990 democratic elections. On May 4, the Council declared its intention to restore full Latvian independence after a "transitional" period; 3 days later, a Latvian was chosen Prime Minister. Soviet political and military forces tried unsuccessfully to overthrow the Latvian Government. On August 21, 1991, Latvia claimed de facto independence. International recognition, including that of the U.S.S.R., followed. The United States, which had never recognized Latvia's forcible annexation by the U.S.S.R. and continued to accredit a Latvian Ambassador in Washington, recognized Latvia's renewed independence on September 2. Since regaining its independence, Latvia has rapidly moved away from the political-economic structures and socio-cultural patterns which underlay the Soviet Union. Latvia has maintained and strengthened the democratic, parliamentary republic that it revived in 1990. Through a U.S. initiative, on April 30, 1994, Latvia and Russia signed a troop withdrawal agreement; Russia withdrew the bulk of its troops by August 31 of that year. Except for some large state-owned utilities, Latvia has privatized most sectors of its economy, which enjoyed years of rapid development before slowing down in 2007. Latvia became a member of the United Nations (UN) on September 18, 1991, and is a signatory to a number of UN organizations and other international agreements, including the International Civil Aviation Organization (ICAO), the International Monetary Fund (IMF), and the World Bank. It is also a member of the Organization on Security and Cooperation in Europe (OSCE) and officially became a member of the North Atlantic Treaty Organization (NATO) on March 29, 2004. On May 1, 2004 Latvia joined the European Union (EU). Since 2004, Latvia has emerged as a significant player in foreign affairs, standing out as a successful post-Soviet transition society. Strong memories of occupation and oppression motivate Latvia to reach out to countries struggling to move beyond authoritarian politics and state-controlled economies. It has worked closely with the U.S. and the EU to promote democracy in Ukraine, Belarus, Moldova, and Georgia. Latvia also supports pro-market, pro-free-trade policies in European and international organizations. Latvia has developed a policy of international security cooperation through participation in crisis management and peacekeeping operations. In 2006, Latvia deployed over 10% of its active duty military to support UN, NATO, and coalition military operations. That percentage is well above the European average in terms of per capita contributions. In 2008, Latvia increased its participation in the NATO International Security Assistance Force (ISAF) in Afghanistan to 170 soldiers and maintained the number in 2009 and 2010. Despite major economic challenges, in 2011 Latvia again increased its NATO ISAF participation to 185. While Latvia was active in the Balkans, budget cuts forced the end of its operations there in 2009. Latvia supported the NATO mission in Kosovo with peacekeepers, and the European Union Force (EUFOR) mission in Bosnia with liaison officers. Latvia also contributed to the EU and OSCE missions to Georgia. In November 2006, Latvia hosted a NATO Summit in its capital, Riga, and in May 2010, it hosted a NATO Parliamentary Assembly. The highest organ of state authority in Latvia is the Saeima, a unicameral legislative body (parliament) of 100 members who are elected by direct popular vote to serve 4-year terms. The Saeima initiates and approves legislation sponsored by the Prime Minister. The Prime Minister is the head of government and has full responsibility and control over the Cabinet. The President, who is elected every 4 years by a majority vote in the Saeima, holds a primarily ceremonial role as head of state, though the President must sign each law into force and has the power to return laws to the Saeima twice for review and revision. The President also has the power to call for a referendum on legislation that the Saeima refuses to change after twice being sent back. In the autumn of 1991 Latvia re-implemented significant portions of its 1922 constitution, and in the spring of 1993 the government took a nationwide registration to determine eligibility for citizenship. Latvia finalized a citizenship and naturalization law in the summer of 1994, which was further liberalized in 1998. By law, those who were Latvian citizens in 1940 and their descendants (regardless of ethnicity) could claim citizenship. 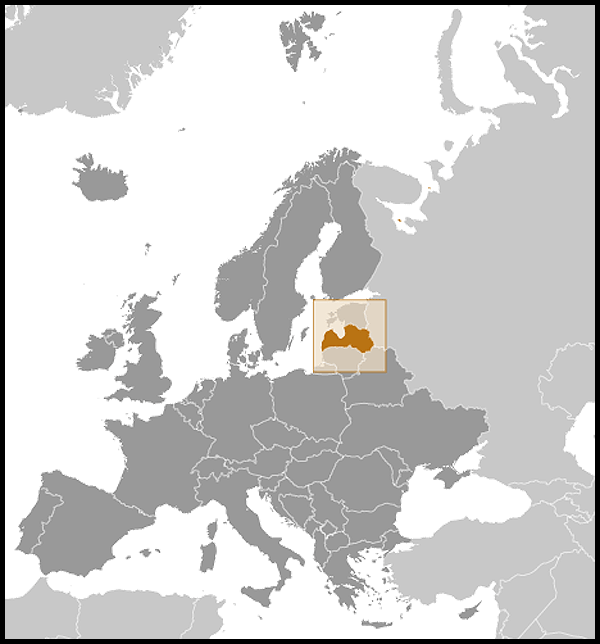 About 83% of Latvia's population possesses Latvian citizenship. Requirements for adult naturalization include a conversational knowledge of Latvian, a loyalty oath, renunciation of former citizenship, 5 years of residency in Latvia, and a basic knowledge of Latvian history. Children born in Latvia to non-citizen parents may acquire citizenship at birth upon completion of an application by the parents. Dual citizenship is allowed for those who were forced to leave Latvia during the Soviet occupation and adopted another citizenship. Convicted criminals, agents of Soviet intelligence services, and certain other groups are excluded from becoming citizens. On March 19, 1991 the Supreme Council passed a law explicitly guaranteeing "equal rights to all nationalities and ethnic groups" and "to all permanent residents in the Republic regardless of their nationality, equal rights to work and wages." In addition, the law prohibits "any activity directed toward nationality discrimination or the promotion of national superiority or hatred." In the June 5-6, 1993 elections, in which more than 90% of the electorate participated, eight of Latvia's 23 registered political parties passed the 5% threshold to enter parliament. The centrist party Latvia's Way received a 33% plurality of votes and joined the Farmer's Union to head a center-right-wing coalition government. The September 30-October 1, 1995 elections resulted in a deeply fragmented parliament with nine parties represented and the largest party commanding only 18 of 100 seats. Attempts to form right-of-center and leftist governments failed; 7 weeks after the election, a broad but fractious coalition government of six of the nine parties was voted into office under Prime Minister Andris Skele, a popular, nonpartisan businessman. In the 1998 elections, the Latvian party structure began to consolidate, with only six parties obtaining seats in the Saeima. Andris Skele's newly formed People's Party garnered a plurality with 24 seats. Though the election represented a victory for the center-right, personality conflicts and scandals within the two largest right-of-center parties — Latvia's Way and the People's Party — prevented stable coalitions from forming. Two shaky governments quickly collapsed in less than a year. In May 2000, a compromise candidate was found in the Latvia's Way mayor of Riga, Andris Berzins. His four-party coalition lasted until parliamentary elections in October 2002. Those elections left Latvia's Way, for the first time since 1993, with no seats in parliament. The New Era Party, which ran on an anti-corruption platform, gained the most seats and formed a four-party coalition government until the abrupt resignation of the Prime Minister in February 2004 over issues relating to personalities and management of the ruling coalition. In 1999, the Saeima elected Vaira Vike-Freiberga, a compromise candidate with no party affiliation, to the presidency. Though born in Riga in 1937, she settled in Canada during the years of the Soviet occupation, becoming a well-respected academic on the subject of Latvian culture and psychology. Following her election, she became one of the most popular political figures in Latvia. She was overwhelmingly re-elected by parliament for another 4-year term in June 2003. She was also credited with bringing Latvia to the world's stage and serving as an important check on the ruling coalitions. With the tacit support of leftist parties, a minority government led by Greens and Farmers Union leader Indulis Emsis took office on March 9, 2004. The new government focused on smoothing Latvia's entry into NATO and the European Union, which took place in the first half of 2004. The government collapsed on October 28, 2004 after parliament voted against the 2005 budget. A new coalition government, led by Prime Minister Aigars Kalvitis, took office on December 2, 2004 and was re-elected on October 7, 2006. Those election results marked the first time that an incumbent administration won re-election in the history of independent Latvia. In July 2007, the Saeima elected Valdis Zatlers, another candidate with no political affiliation, to the presidency. An orthopedic surgeon by trade, Zatlers was the director of the Latvian Traumatology and Orthopedics Center until his election and had no prior political experience. His start was clouded by charges that he had accepted supplemental payments for medical services on which he did not pay taxes. Zatlers complied with investigations which in the end concluded he had committed no breaches of law. In December 2007, Prime Minister Kalvitis resigned after his government came under intense criticism for attempting to dismiss the head of the anti-corruption bureau. President Zatlers nominated veteran politician Ivars Godmanis to form a new government. Godmanis' governing coalition consisted of the same four center-right parties that made up the previous government. On December 23, 2008, the International Monetary Fund approved a $2.35 billion rescue loan for Latvia. The loan was part of a $10.5 billion bailout that included additional funding from the European Commission (EC), World Bank, and the Scandinavian countries. The IMF funds were intended to "stem the loss of bank deposits and international reserves and to take fiscal measures to limit the widening of the budget deficit." On January 13, 2009, the worsening economic crisis sparked an unprecedented riot when, after a political rally to protest government actions on the economy, hundreds of disgruntled citizens took to the streets of Riga, with a smaller group smashing police cars and windows. On February 20, Prime Minister Godmanis resigned amidst growing public distrust and tension over Latvia's economic decline. On February 26, President Zatlers nominated European Parliament member and former Finance Minister Valdis Dombrovskis (New Era) to be Prime Minister. Dombrovskis took office on March 13, 2009, when the Saeima approved his cabinet. For the next year his coalition was made up of five center-right parties; three of the previous four coalition partners, plus New Era and Civic Union. After assuming office, Dombrovskis announced that the country was "on the verge of bankruptcy" and that major budget cuts would have to be made to secure financial stability. Accordingly, Latvia implemented $1 billion in budget cuts in 2009 and another $1 billion in cuts in 2010. In March 2010, the largest party of the coalition pulled out due to disputes over how to handle Latvia's economic crisis, leaving Latvia with a minority government. Dombrovskis was again named Prime Minister after October 2010 elections. Center-right parties coalesced to form the Unity bloc, winning a plurality of seats, and a majority coalition was formed with the Union of Greens and Farmers. A nationalist bloc supported the government from outside the cabinet. Voters largely rejected the populist message put forward by the For a Good Latvia party. The predominately Russophone and left-of-center Harmony Center coalition had its best showing ever, but its coalition talks with Unity failed. On May 28, 2011 President Zatlers, disturbed by parliament's refusal to waive immunity for two members of parliament in relation to a corruption investigation, decided to call for a referendum on the dissolution of parliament for the first time in Latvian history. Latvian presidential elections were held on June 2 in parliament, and Zatlers lost to Andris Berzins (a member of parliament for the Union of Greens and Farmers). Berzins obtained 53 of 100 votes in a second round, securing a majority; he took office in early July. The referendum on parliamentary dissolution took place on July 23 and passed with 94.3% of voters supporting dissolution. Parliamentary elections were held September 17. A new coalition government was sworn in on October 25, made up of Unity, Zatlers' Reform Party (ZRP), National Alliance (a right-wing party), and six unaffiliated former members of ZRP. Even though Harmony Center won a plurality of votes and seats, it was excluded from the new government. Harmony Center and the Union of Greens and Farmers formed the opposition. Prime Minister Dombrovskis was confirmed for a third consecutive term, a first in Latvian political history. Latvia's flag consists of two horizontal, maroon bands of equal width, divided by a white stripe one-half the width. The national holiday is November 18, Independence Day, which marks Latvia's 1918 independence. Latvia maintains an embassy (http://www.latvia-usa.org/) in the United States at 2306 Massachusetts Ave NW, Washington DC 20008 [tel: (202) 328-2840]. When Latvia emerged from Soviet occupation in 1991, its centrally planned economy faced the dual challenges of reinventing itself to face private sector competition and cultivating an entrepreneurial spirit. Latvia's economy contracted sharply in the immediate aftermath of the Soviet Union's collapse, including a 32% decline in 1992 alone. Since reestablishing its independence, however, Latvia has developed a diverse market-oriented economy with the potential to serve as an East-West services and trade hub. Latvia's real economic growth averaged a steady 5.5% between 1994 and 2005 following the introduction of reforms and the establishment of the country's national currency, the lat, in 1993. Real per capita income nearly doubled over the course of the decade and the prospects for Latvia's economy seemed bright as the country joined the European Union in May 2004 and set its sights on adopting the euro (EUR) as its national currency. Initially, it seemed like there was cause to celebrate as the next 3 years (2005-2007) brought on average economic growth of nearly 11% per year. As in much of the rest of Europe and the United States, Latvia's growth during this time was fueled by a credit boom that bolstered domestic demand, drove prices and wages up unsustainably, and resulted in a massive housing bubble. Government spending also rose rapidly during this period, further fueling the price and asset bubbles. Inflation topped out at 15.3% in 2008 and delayed the country's entry into the euro zone common currency area. (The lat is pegged to the euro; Latvia has reset 2014 as its new target year for acceding to the euro.) When the credit boom went bust in 2008, the economy fell into a recession, shrinking by 4.6% in 2008 and by 18% in 2009. It resulted in skyrocketing levels of unemployment (EU harmonized rate of 19.3% in June 2010 — the second-highest in the European Union) and a collapse in government revenue leading to a rapid rise in the government's fiscal deficit. With the economy breaking down and the banking system weakened by the collapse of the country's second-largest bank, Parex Banka, the government turned to the European Commission and the International Monetary Fund for assistance in late 2008. The assistance package, totaling approximately EUR 7.5 billion ($10.5 billion), is centered on restoring competitiveness through structural economic adjustment, fiscal prudence, and factor price deflation. The program's goal or exit strategy calls for Latvia to reduce the country's budget deficit to 3% of GDP by 2012 in order to pave the way for euro adoption in 2014. Annual deficit targets were agreed with the European Commission and the IMF to help Latvia achieve its goal, and the Government of Latvia has enacted a series of tough fiscal austerity budgets that have already reduced the deficit by 13% of GDP. Additional fiscal consolidation will be necessary to achieve the country's goal and complete its "internal devaluation." Recently, here have been a series of positive developments. For example, Latvia's current account balance has improved markedly. From 2006 through 2008, it experienced a deficit ranging from 12.6% to 22.5% of GDP, but since early 2009 Latvia's exports have outnumbered its imports. Industrial production and exports were both up nearly 25% in the year ending October 2010. 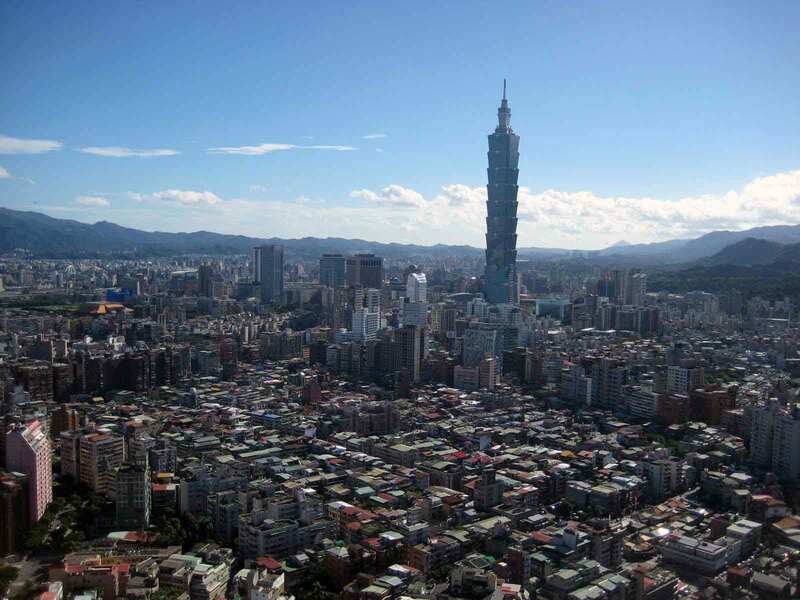 The country received a boost when Standard & Poor's upgraded the country's sovereign credit rating in early December 2010. Latvia's GDP growth rate is estimated at around 4.0% for 2011. U.S.-Latvian economic relations are dynamic, but with plenty of room for growth. Service industries like telecommunications, transport and logistics, and renewable energy technologies are all potential areas for U.S.-Latvian investment and trade. Total bilateral trade in 2010 was $488 million with the U.S. running a trade surplus of $124 million. U.S. exports to Latvia were up 14.3% and imports were up 29.4% in 2010. The stock of U.S. foreign direct investment in Latvia totaled $373 million as of the end of the second quarter of 2011. Latvia has been a member of the World Trade Organization since 1999, and Latvia and the United States have signed treaties on investment, trade, intellectual property protection, and avoidance of double taxation. Latvia's defense concept is based upon four basic pillars: collective defense as a member of NATO, professionalization of the armed forces, support and coordination with civil society, and international military cooperation. The armed forces consist of 4,500 professional regular forces and 8,500 additional volunteers of a home guard called the "Zemessardze". The regular forces are composed of the land forces, an air force focused on air surveillance and search and rescue, and naval forces focused on coastal surveillance, assertion of sovereignty, mine countermeasures, search and rescue, and environmental protection. The Zemessardze is an autonomous organization which performs traditional national-guard duties such as crisis response and support for military operations. The Latvian National Armed Forces became fully professional in November 2006. Defense spending has fallen to 1.14% of GDP as a result of the economic crisis, but the government is committed to increase defense spending as the economy recovers. After regaining its independence, Latvia began to work at reintegrating into the West. In 1991, Latvia joined the Organization on Security and Cooperation in Europe (OSCE) and became a member of the United Nations (UN). It is party to a number of UN organizations as well as other international agreements including the International Civil Aviation Organization (ICAO), the International Monetary Fund (IMF), and the World Bank. Since 2004, Latvia has been an active member of the North Atlantic Treaty Organization (NATO) and the European Union (EU). Latvia has emerged as a significant international player, supporting peace and democracy world-wide. Per capita, it is one of the largest contributors to international military operations. It has deployed troops to Iraq, Afghanistan, Georgia, and the Balkans. It also works closely with the U.S. and the EU to support and promote democracy in the former Soviet Union states of Ukraine, Belarus, Moldova, and Georgia. A testament to the close relationship between the U.S. and Latvia is the fact that President George W. Bush visited the country twice, the second time to attend the NATO Summit held in Riga on November 28-29, 2006. Russia has expressed concern over how Latvia's language and naturalization laws affect Latvia's Russian-speaking population. Ethnic Russians comprised 28% of the population in 2010. In turn, Latvia is interested in the welfare of ethnic Latvians still residing in Russia. Latvia and Russia signed a border treaty agreement in March 2007. It was ratified by both sides and went into effect at the end of 2007. Latvia maintains embassies in the United States, Austria, Azerbaijan, Belarus, Belgium, Canada, the People's Republic of China, the Czech Republic, Denmark, Egypt, Estonia, Finland, France, Germany, Georgia, Greece, Hungary, Ireland, Israel, Italy, Japan, Kazakhstan, Lithuania, the Netherlands, Norway, Poland, Portugal, Russia, Slovenia, Spain, Sweden, Turkey, Ukraine, the United Kingdom, and Uzbekistan. It also operates missions to the United Nations in New York City and Geneva, the European Council, the European Union, the Chemical Weapons Nonproliferation Organization, NATO, the Organization for Security and Cooperation in Europe, the World Trade Organization, UNESCO, and the UN Council on Food and Agriculture. Latvia has a Consulate General in Russia; Consulates in Belarus and Russia; Honorary Consulates General in Brazil, Denmark, Italy, Cyprus, Lebanon, Norway, Sri Lanka, Turkey, and Venezuela; and Honorary Consulates in Argentina, Armenia, Australia, Austria, Belgium, Bulgaria, Canada, Chile, Columbia, Croatia, Cyprus, Denmark, Dominican Republic, Egypt, Finland, France, Georgia, Germany, Greece, Hong Kong, Iceland, India, Indonesia Ireland, Israel, Italy, Jamaica, Japan, Jordan, Kazakhstan, Kyrgyzstan, Luxembourg, Malta, Morocco, Macedonia, Mexico, Moldova, the Netherlands, New Zealand, Norway, Pakistan, Panama, Peru, Philippines, Poland, Portugal, San Marino, South Africa, South Korea, Spain, Syria, Sweden, Switzerland, Thailand, Tunisia, Turkey, Ukraine, the United Kingdom, and the United States. The United States established diplomatic relations with Latvia on July 28, 1922. The U.S. Legation in Riga was officially established on November 13, 1922 and served as the headquarters for U.S. representation in the Baltics during the interwar era. The Soviet invasion forced the closure of the legation on September 5, 1940, but Latvian representation in the United States has continued uninterrupted since 1922. The United States never recognized the forcible incorporation of Latvia into the U.S.S.R. and views the present Government of Latvia as a legal continuation of the interwar republic. Latvia and the United States have signed treaties on investment, trade, intellectual property protection, extradition, mutual legal assistance, and avoidance of double taxation. Latvia has enjoyed most-favored-nation treatment with the United States since December 1991. In 2008, Latvia joined the visa waiver program. The U.S. Embassy (http://riga.usembassy.gov/) in Latvia is located at 1 Remtes Street, Riga [tel. (371) 6710-7000].